Well, “friends” may be a bit much, but a character or two was revisited; from the relatively arcane and kind of distasteful (such as the reprise of his disturbed war vet in puppetry class bit) to the immensely popular and career-making. Regarding the latter, we of course refer to Stefon; Weekend Update‘s flamboyant city correspondent, who frequently regaled former Update anchor Seth Meyers — and now Colin Jost and Michael Che — with his rundown of the city’s hottest spots, and the surreal, absurd, and sometimes disturbing delights they offered the intrepid nightlifer. As has long been a trademark of the bit, Hader went all Harvey Korman, and indeed did break character a few times, as he tried to contain his laughter. 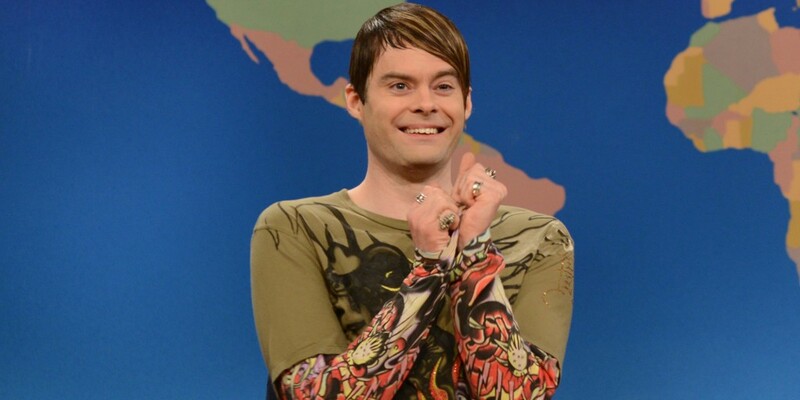 Stefon writer John Mulaney — now starring in his own sitcom on Fox — returned to write the bit, and succeeded as always in surprising Hader with the jokes he added at the last minute, between dress rehearsal and broadcast (a running gag about 90s MTV personality Dan Cortese seemed to amuse Hader greatly). Also along for the ride was fellow SNL alum, and Hader’s The Skeleton Twins co-star, Kristen Wiig; who popped up in sketches throughout the evening. Tribute was paid to the late, great Jan Hooks, who passed away this week, by showing the old Tom Schiller short “Love is a Dream”; a disarmingly uncynical and unapologetic piece of sweetness, featuring Hooks and the sadly long-deceased Phil Hartman. Hozier was the musical guest.